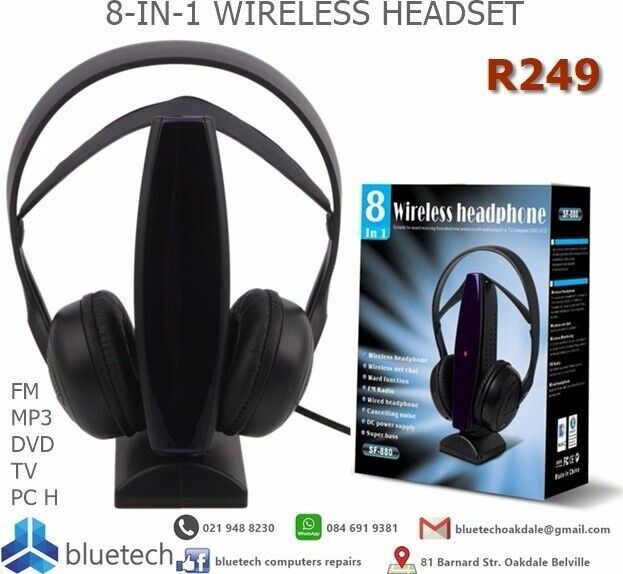 Hi, I’m interested in 8-IN-1 WIRELESS HEADSET+FM HEADPHONE FOR MP3 DVD TV PC, Bluetech Computers . Please contact me. Thanks! The transmitter can be compatible with multi-media such as TV,PC,Game player,CD,DVD,VCD,MP3,MP4,etc.TV accompanying:You can enjoy your favorite TV show freely without disturbing anyone else by using wireless headphone. The headphone can be used as FM radio separately,search and focus channels automatically. A perfect audio-chat tool,enjoy surfing fun. Put the transmitter at the side of elders,babies or parents,you can hear the sound of one in time offering convenience for families with babies or parents to take care. There is a receiver audio input jack, coupled with the audio cable (which contains configuration), can be used as wired headset to use it. To wear headphones, an effective reduction of external noise interference, but also you have a pristine, clear of personal music world. Equipped with audio cable,the receiver can be used as a wired headphone. 9.Sound beautiful stereo strong, the full enjoyment of music. 10.Suitable for sound receiving from electronic products with TV,Computer,DVD,VCD. - From TV shows to movies to games, it’s all available on Apple TV. - Enjoy content from iTunes and apps like Netflix, Hulu, and ESPN - or use the Siri Remote to find just what you want. - And you can even use the Siri Remote as a controller for the Apple TV games available on the App Store. 32inch Sony Bravia TV, Zyxel Router and 300MB N USB Adapter, all in excellent condition. Adapter has never been used. TV includes remote. All specs are in the photos R3000 for everything.